Pollutants of all kinds are being directly discharged into the Black Warrior River and its tributaries by industries, mines, municipalities, and private operations. The National Pollutant Discharge Elimination System (NPDES) under the Clean Water Act (CWA) of 1972 called for the elimination of industrial point source discharges by 1985, but we have seen an increase, not a decrease. The Alabama Department of Environmental Management (ADEM), our state environmental agency, is charged with administering the NPDES program, a duty delegated to it by the Environmental Protectection Agency (EPA). Unfortunately, ADEM has been issuing NPDES permits and then failing to adequately regulate and enforce the permits for decades. The problem is that politics as usual in Alabama allows money to be funneled into political coffers by regulated industries. Those who are supposed to be regulated by an unbiased state agency are wrongfully calling the shots at the expense of all Alabamians public health. BWRk was formed to give the river and the people who enjoy it a voice and the right to enforce the Clean Water Act. While BWRk has tried to hold polluters accountable, ADEM and the Attorney General’s office have done all they can to stymie our efforts and protect polluters. Alabamians have been subjected to this wrongful representation for too long, and so on January 14th the Alabama Rivers Alliance filed a petition with EPA on behalf of fourteen Alabama environmental organizations to remove ADEM’s NPDES permitting authority. Let’s hope the EPA can help straighten out our mess. 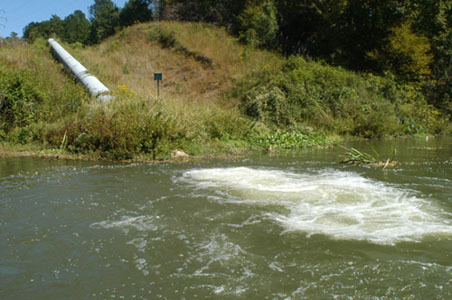 Point source pipe discharging into a slough on the Mulberry Fork from Alabama Power’s Gorgas Steam Plant coal ash pond.